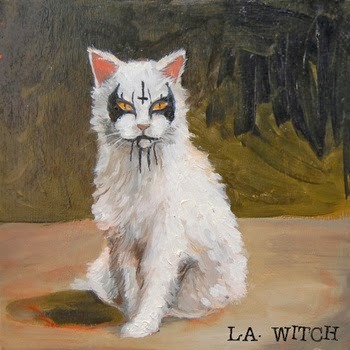 WHY: To start with, the cover of this EP has an illustration of a white cat with a face done up in black, Kiss-meets-the-dark-side makeup. We could just stop it there, but thankfully L.A. Witch is more than just a clever cover. Scuzzy, fuzzy, and loud seem to be three of my favorite words when it comes to music, and L.A. Witch produces all three in spades here. The three songs on this EP are spectacularly scuzzed up, and crackle with an attitude somewhere between bored and aggressive. From the belligerent posturing of “Get Lost” to the off-kilter, acoustic-driven “Heart Of Darkness” to the accusatory slow burn of “You Love Nothing,” this is one hell of an EP.